The music of the great lutenist Silvius Leopold Weiss (1686-1750), the exact contemporary and friend of J.S. Bach, is at last becoming increasingly well known through recordings. Most of the music that has been available in print, however, comes from one of the two principal sources, a manuscript of c1717-1725 now in the British Library in London. 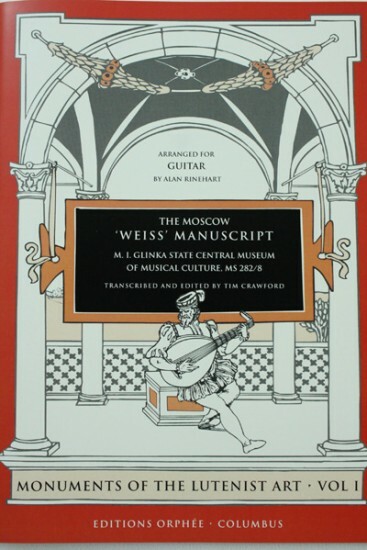 That manuscript has been edited in the 'Complete Works' edition of Weiss's music, and the six manuscript volumes in the Sachsisches Landesbibliothek, Dresden, are forthcoming in the same series. But there are a number of other, less well-known manuscripts of great importance which remain virtually untapped sources of this marvelous music. The present MS, unknown in the West until 1963, was published in 1976 in an eccentric edition which is now out of print. Important recent research on the MS shows that it could not have been compiled during Weiss's lifetime, nor in his home city of Dresden, but at least a decade after his death and in Russia. The present edition aims to put the music in that context, and to explain some of its unusual features. An attempt has been made to distinguish between music that is definitely by Weiss, and music that might not be. Reaching such conclusions is necessarily a subjective matter, and the editor acknowledges that there may be those who will remain convinced that every note in the MS was composed by Weiss himself.